Amphenol Fiber Systems International is excited to announce the product launch of our TFOCA-XBT4™, which incorporates expanded beam technology into the already proven TFOCA-II connector®. The TFOCA-II® physical contact connector is the standard fiber optic connector for the US Army, designed for and proven in the harshest of military and industrial applications. The TFOCA-XBT4™ is the next logical step, integrating expanded beam technology into the most popular harsh environment fiber optic connector in the world. 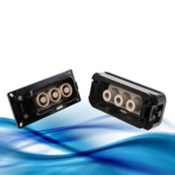 The environment that you want your network to withstand is no longer an issue with Martec’s impedance matched co-axial connectors. Our hermetic connectors use technologies and materials to ensure that whatever is happening outside does not affect network performance. 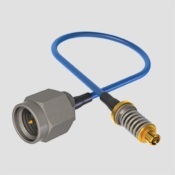 Martec’s connectors can be supplied to withstand pressure differentials up to 60,000 psi, while their operating temperature can range from -55 °C to +250°C, depending on the materials selected. 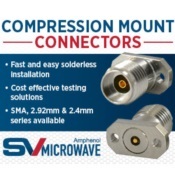 Amphenol Ltd launched the Rhino connector series at Farnborough 2014 and has now introduced new members of the family. 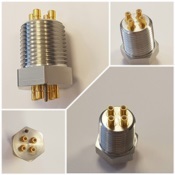 In addition to the original Rhino 38999 connector Amphenol now offers circular connectors with push-pull and reverse bayonet mating systems to suit different applications and market requirements. This has been further complemented by the introduction of thru-bulkhead versions allowing cables to be connected through penetration panels.